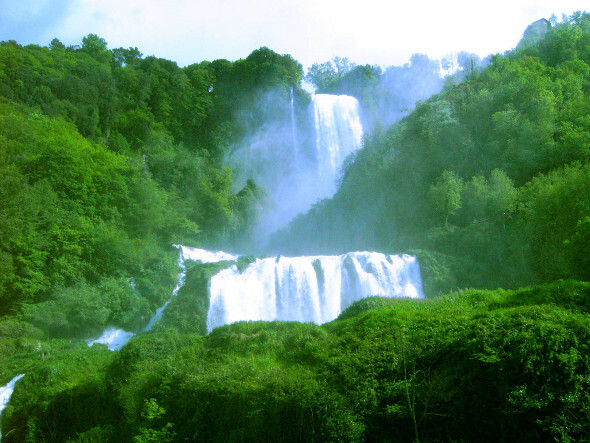 Taking the State Road "Valnerina" from Terni, you'll reach the very famous Marmore Waterfalls after only 7 km. This is definitely an absolute must for whoever decides to visit Umbria. >> Do you want to see this show? Check it out now of the best houses and hotels in the vicinity of Marmore Falls. The Waterfalls, which are immersed in a natural scenery of incomparable beauty, are an artificial work due to the Romans. In fact, at that time, the Velino river was greatly enlarged and had created a vast zone of stagnant waters, swampy and unhealthy. Aiming to make these waters deflow, the consul Curius Dentatus had a canal dug which directed them in direction of the Marmore cliff. From there, he had them precipitate, in a total fall of 165 meters, into the river-bed of the Nera river which runs along below. In every age, the beauty of the Waterfalls has inspired poets and artists, among these: Virgilius, Cicero, G. Byron, and many others. For about 50 years now the waters of the Waterfall are used to fuel the hydroelectric power plant Galleto. Therefore, the spectacle of the Waterfalls can only be admired during the opening hours which are quoted in the table below. It was in fact due to the abbundance of these waters and the energy they generate that it was possible to establish the metal-working, electrochemical and electric industries at Terni. 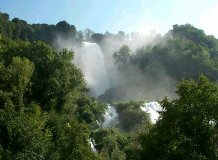 There are offers for vacation rentals and hotels in the areas of Marmore Falls! Click and Consult them immediately. - entrance after 8:00 p.m.
bus shuttle service during the weekend and holidays which links the lower to the upper outlook. The service will be available from the 1st April to 31st October in according to the timetables visible in the ticket office - information in the 2 ticket offices. From April to the end of Septembre, there is also a paid shuttle-bus service; during the day, the guests are moving from the Lower Belvedere of Marmore's Falls to the Upper Belvedere. The fee for the service is € 1.10 for a trip and a return; free for the children until 5 years old. The service is not available every day: check the pdf for the calendar and settlement. >> If you've decided to see Marmore Falls you should contact now farmhouses and hotels in its vicinity >> click this link.